Mold grows in jars, usually ones containing food. Rather than throw away the jar, clean it out. 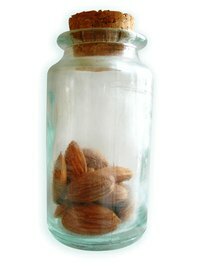 Even after you remove what the mold was growing on inside of the jar, it needs to be cleaned out. Use either bleach or vinegar to accomplish this. It’s important to remember to clean only glass jars this way. Plastic jars containing mold need to be thrown away because the mold soaks into the plastic. Fill the jar halfway with bleach. Screw on the lid tightly. Shake the jar up and down for 30 seconds. Swirl the bleach in the jar for another 30 seconds. Open the lid and dump out the bleach. Rinse out the jar and the lid with hot water. Fill a jar 3/4 full of white distilled vinegar. Put on the lid. Shake the jar to ensure the vinegar covers the entire inside. Let the jar sit for two hours. Dump out the jar. Rinse it with hot water to remove any lingering mold pieces.